Hanover Brazil is the North American representative for the Plantar Group (www.plantar.com.br), the largest reforestation company in Brazil since 1967, and one of the largest in the world. Plantar serves primarily as a resource supplier and manager for the pulp, metallurgical, wood, and charcoal industries in Brazil and beyond to Europe and North America. 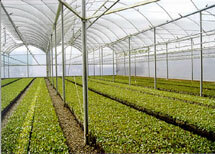 The company's proprietary processes and high-tech nurseries create plantings of over 100 million trees each year, mostly Eucalyptus. Plantar provides services to major companies such as Aracruz S.A., Brazil's largest pulp and paper manufacturer, the Kingsford Division of the Clorox Corporation, and the Royal Oak Corporation. Plantar also manufactures treated eucalyptus phone and electrical poles, rail ties, fence posts, and comparable products. A committed practitioner of "Green" principles, the Plantar Group adheres strictly to the principles of the Forest Stewardship Council and fully cooperates with environmental organizations such as Greenpeace and the World Wildlife Fund to insure the health of the environment. Plantar is also heavily involved with the World Bank's carbon project, for which its forests are a major supplier of "green" credits. If your company is interested in developing a permanent, dependable source of environmentally viable wood and pulp products, please contact us to discuss details. There is no project beyond the scope of the Plantar Group's reforestation technology and know-how. Plantar means simply "to plant," something that no one does better, and we look forward to planting the seeds of a long-term relationship with your organization. Hanover Brazil can provide sawn lumber and plywood in Eucalyptus, Elliott pine, and Taeda pine from selected mills in Brazil's sustainable timber industry. Applications for furniture production, panels, laminated or planed wood, construction lumber, pallets, and various other products. In addition to pine and eucalyptus, numerous Brazilian hardwoods are available to specifications, such as Brazilian Red Cedar, Brazilian Cherry (Jatobá), Brazilian Walnut (Ipé), Tatajuba, Tigerwood, Sucupira, and others. We can provide finished and unfinished flooring from multiple manufacturers in many quality woods such as Brazilian Cherry (Jatobá), Brazilian Walnut (Ipé), Brazilian Teak (Cumaru), Santos Mahogany (Cabreuva), and numerous others. Prices can be quoted either FOB-Brazil or landed at your port of destination. Please contact us with your requirements. Engineered single-strip, long-strip, multi-laminate in Tigerwood and Sucupira.